It was her last day in high school. Her sister was about to perform on stage and just then the choreographer noticed that she was missing the prop for her dance. She volunteered to get it immediately from the classroom where they kept the same. She ran through the dark corridors without knowing what was awaiting her. Her classmates decided to play a prank. Few boys emerged from the dark and surrounded her as if they were about to violate the already trembling soul. She didn’t know what to expect and had tears falling down her face. She ran back to the stage, wiping off the tears. And she saw her Dad waiting and searching for her. Little did she know that an hour had passed and this gag from her friends would change her life forever. As expected, all her Dad saw was his lil’ girl coming out from the dark corridors crying, and being followed by few boys. SLAP!! on her face! It was the first time that her Dad had hit her. Never had she seen him this angry. All the way home, he didn’t utter a word. He wasn’t ready to listen to her even. But once home, when she tried to explain for the zillionth time that she was not at fault, he said, “Wish you were dead. Wish you were never born as my daughter!”. She went numb and closed the door behind her. Why didn’t he understand her? He was hurt, she knew. But he is her Dad and she was his little girl. She felt her whole world collapsing right in front of her. There was no point to live a life which her Dad despises of. Its all her fault. She took the knife and aimed at the pulsating vein in her hand. It would take just a moment to end this all. Why live a life of shame! Just then her door flung open and it was her Dad. She was back to life. Do you think this was some Bollywood movie? No. It is not. What would have happened if her Dad hadn’t come back? Do you think she is stupid? September 10, is World Suicide Prevention Day co-sponsored by the World Health Organization and the International Association for Suicide Prevention (IASP) and the theme of this year is Reaching Out and Saving Lives. Did you know that every 40 seconds the world loses someone to suicide? Yes, suicide is the Silent Epidemic. Each of us play a big role in preventing suicides- if only we wait and listen. You might have seen some warning signs in your friend. She would be saying, “wishing to be dead”, or changes in behavior and eating habits or losing interest in normal activities. What do you do? Laugh it off and ignore? Think she is just seeking attention? Maybe she is. But why not take an extra step to help? Suicide prevention starts only with recognizing the warning signs and taking them seriously. 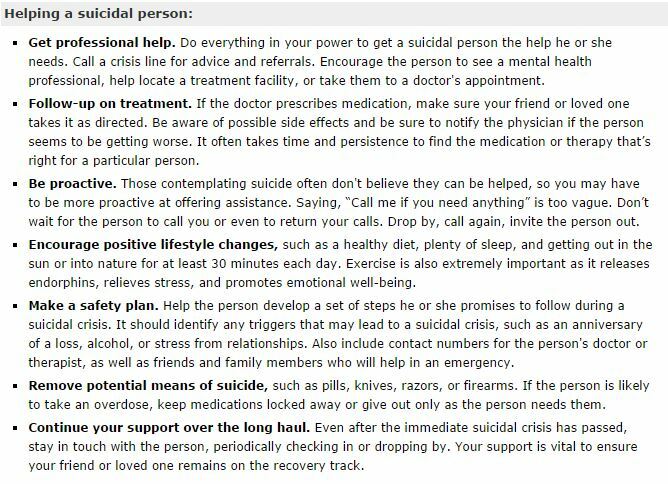 Because a suicidal person may not always ask for help. And that doesn’t mean that help isn’t wanted. Most people who commit suicide don’t want to die—they just want to stop hurting. If you or someone you know is living with depression, you should understand that the symptoms may include feelings of sadness and hopelessness. These would result in self-harm or suicide. Understand that these are not character flaws or signs of personal weakness, nor are these conditions that will just go away on their own. Let’s spread the message of love and appreciation. You never know what someone may be going through. Let’s reach out and connect. Find the right words to say. Let’s feel than know. Let’s listen than talk. Let’s stay together and save a life. 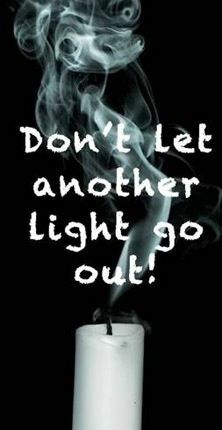 Lets all please try to make a difference! Here is the list of Hotline Numbers in India. And lend me a hand? Linking with Corinne for September Challenge. Filed Under: I Strongly Feel for it.. Do you? « Dear 16-year old Me.. This is a raw nerve for me too. Very few people understand and take depression seriously. Sometimes, suicide happens in perfectly normal people in a fit of rage or emotions too. Do read them and add your thoughts. Brilliant post. All that people suffering from depression is someone to hear them out. Unfortunately, nobody has 5 minutes in a day as these unfortunate ones come across as attention seekers to many. I am doing my bit on Quora so that people can reach out to me if they need someone to hear them out. Great article shalu..hope this reaches to everyone . That’s a great way to raise awareness about this silent killer, Shalini. Thanks …shailini…really this post matters a lot …keep posting.. It is an excellent article spreading awareness.The cognizance of problem and the path to solution will surely edify minds and bring positive impact on lives.Keep up the good work :). I was also that girl once upon a time..i m glad I came out of all that darkness now..
Glad that she didnt do what she intended to do! Hugs Shalini! Proud of you! Wow such an important message. It is so real and horrifying. Suicide is a terrible problem. Depression that deep is unimaginable. I pray that your article will have an impact and will help someone reach out to help. Thank you for sharing. Excellent article to spread the awareness.. And the story Omg!! !thank god , nothing bad happened… Thanks shalini. Keep writing. God bless!! More awareness and compassion needed about this. Good job highlighting it, Shalini. Was this a true story? Powerful story and great information. Thanks for spreading the word, Shalini. Thanks, Corinne. Doing my bit.